The Supreme Court has ruled that the Armed Forces Tribunal (AFT) had no power to entertain all cases filed by personnel governed by the Army Act. 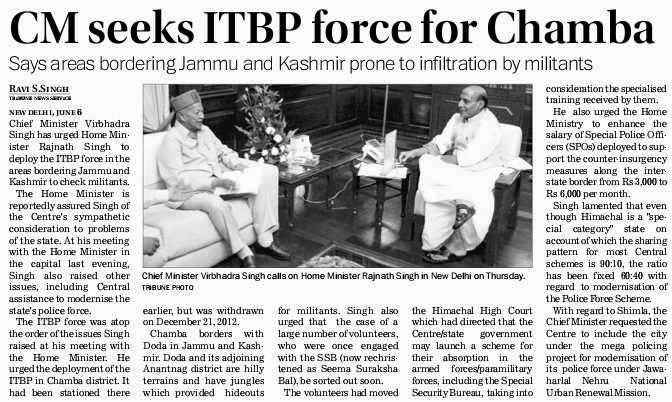 Merely because a litigant “is subject to the Army Act would not by itself be sufficient to conclude that the tribunal has the jurisdiction to deal with any case brought before it by such a person,” a Bench comprising Justices BS Chauhan and AK Sikri clarified. “It would depend upon the subject matter which is brought before the tribunal and as to whether it fell within the definition of ‘service matters’ as contained in Section 3(o) of the AFT Act,” the Bench held. 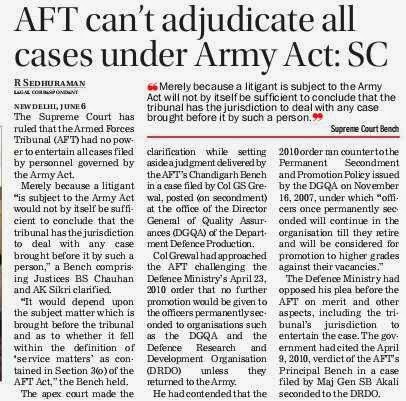 The apex court made the clarification while setting aside a judgment delivered by the AFT’s Chandigarh Bench in a case filed by Col GS Grewal, posted (on secondment) at the office of the Director General of Quality Assurances (DGQA) of the Department Defence Production. Col Grewal had approached the AFT challenging the Defence Ministry’s April 23, 2010 order that no further promotion would be given to the officers permanently seconded to organisations such as the DGQA and the Defence Research and Development Organisation (DRDO) unless they returned to the Army. The Defence Ministry had opposed his plea before the AFT on merit and other aspects, including the tribunal’s jurisdiction to entertain the case. The government had cited the April 9, 2010, verdict of the AFT’s Principal Bench in a case filed by Maj Gen SB Akali seconded to the DRDO. 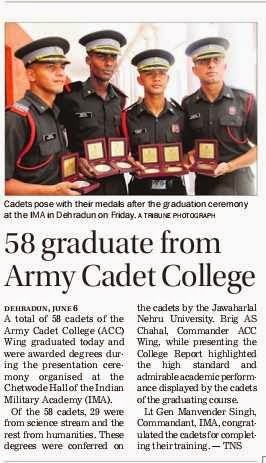 A total of 58 cadets of the Army Cadet College (ACC) Wing graduated today and were awarded degrees during the presentation ceremony organised at the Chetwode Hall of the Indian Military Academy (IMA). Of the 58 cadets, 29 were from science stream and the rest from humanities. These degrees were conferred on the cadets by the Jawaharlal Nehru University. Brig AS Chahal, Commander ACC Wing, while presenting the College Report highlighted the high standard and admirable academic performance displayed by the cadets of the graduating course. Russia's President Vladimir Putin has posed the question whether the West, led by the United States, is beginning another Cold War. What is not in doubt is that the Group of Seven major powers met by ostentatiously leaving out Russia and gave a warning to Moscow that unless it desisted from helping the rebels in Eastern Ukraine, who are fighting the central authorities in Kiev, there would be further sanctions against Russia. Indeed, all accounts suggest that this is the most frigid state of relations between Russia and the major Western powers since the end of the Cold War. The point of contention of course is Ukraine, and the West felt frustrated that instead of being able to embrace Russia's immediate neighbour with its immense landmass and a population of 46 million into the European Union (EU) and the NATO military alliance, Moscow frustrated the plan. There is little recognition in the West, except in Germany, that by pointedly attacking Russian interests in a country with which Moscow has long and abiding ethnic, religious and trade interests, it was provoking President Putin. The result, as the world knows, was Russia's action in annexing the Crimean peninsula, a majority of whose population is ethnic Russian, and is the home of the important Russian Black Fleet. Ironically, Crimea was given away to Ukraine by Nikita Khushchev in days when Ukraine was part of the Soviet Union. A series of Western sanctions against Russia followed, but they were in effect soft sanctions involving bans on prominent Russians and on some bank dealings. They were basically to make the point that unlike rather the old game of changing national boundaries by imperial powers, it was no longer kosher to do so. The West tacitly accepted the Crimean annexation but was fearful that Moscow would seek to annex parts of the Russian-speaking south-east. There were 40,000 Russian troops massed on the Ukraine border and armed rebels had made inroads in Donesk and Lugansk, among other cities, to take over administrative buildings. Apart from local fighters, there were credible reports of Russian fighters coming to the aid of their comrades. It would appear that Russian moves were aimed at two objectives: to seek a federal constitution giving federal powers to the regions to the majority Russian-speaking population of Ukraine's south-east and to press a non-aligned status for Ukraine between the West and Moscow. Seeing the determination of the West and its anger over Crimea's annexation, Moscow chose to dilute its original plans to avoid a new confrontation. It accepted the fact that Ukraine would be integrated into the European Union while seeking a special dispensation for the south-east and drew a new red line over future membership of NATO. Further, Moscow accepted the legitimacy of the presidential election held to replace President Viktor Yaunkovych, who had to flee Kiev, paving the way for a future meeting between the President-elect, Petro Porshenko and President Putin. It is one of the many ironies of the Ukraine crisis that Mr Porshenko, is an oligarch nicknamed the chocolate king for his many interests, including those in the confectionery industry. Thus far, he has struck a confident note declaring that he knows the Russian leader and knows how to do business with him. The truth is, of course, that the European Union's trade with Russia is vastly greater than US dealings. Germany, for instance, is a major importer and exporter and Europe receives about a quester of its oil and gas supplies from Russia. No wonder the German elite is split down the middle between the hardliners and those who oppose sanctions against Moscow. Chancellor Angela Merkel is siding with the hardliners for tactical and geopolitical reasons. How the increasing frigidity between Russia and the West will play out remains to be seen but the crisis involves bigger questions. They concern Russia's place in the new world order. Understandably, President Putin is resisting the new role assigned to his country of being a nation of little consequence that can be trampled upon by a new resurgent West marching under the flag of liberal democracy. 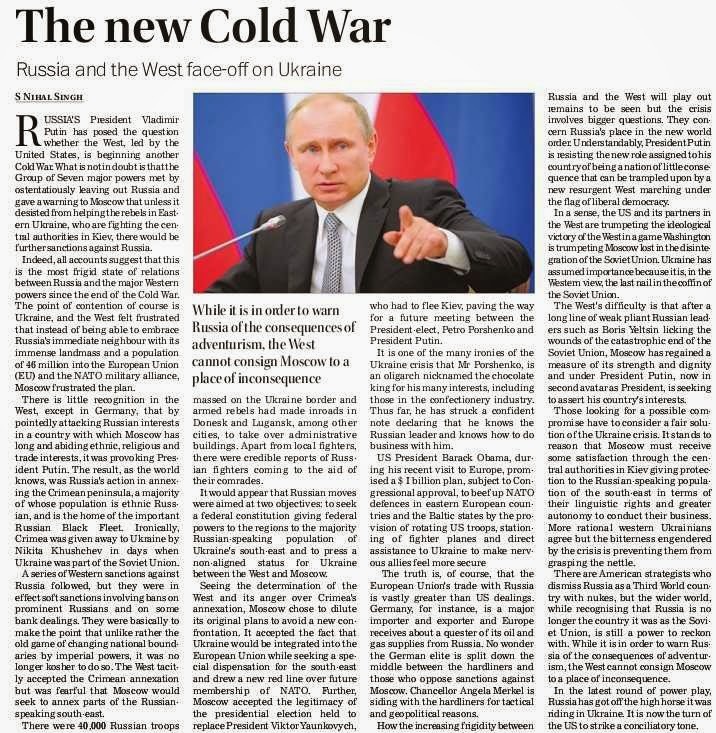 In a sense, the US and its partners in the West are trumpeting the ideological victory of the West in a game Washington is trumpeting Moscow lost in the disintegration of the Soviet Union. Ukraine has assumed importance because it is, in the Western view, the last nail in the coffin of the Soviet Union. The West's difficulty is that after a long line of weak pliant Russian leaders such as Boris Yeltsin licking the wounds of the catastrophic end of the Soviet Union, Moscow has regained a measure of its strength and dignity and under President Putin, now in second avatar as President, is seeking to assert his country's interests. Those looking for a possible compromise have to consider a fair solution of the Ukraine crisis. It stands to reason that Moscow must receive some satisfaction through the central authorities in Kiev giving protection to the Russian-speaking population of the south-east in terms of their linguistic rights and greater autonomy to conduct their business. More rational western Ukrainians agree but the bitterness engendered by the crisis is preventing them from grasping the nettle. There are American strategists who dismiss Russia as a Third World country with nukes, but the wider world, while recognising that Russia is no longer the country it was as the Soviet Union, is still a power to reckon with. While it is in order to warn Russia of the consequences of adventurism, the West cannot consign Moscow to a place of inconsequence. In the latest round of power play, Russia has got off the high horse it was riding in Ukraine. It is now the turn of the US to strike a conciliatory tone. Defence Minister Arun Jaitley may get to see the salvaged INS Sindhurakshak submarine during his Mumbai visit today where he will review the operational preparedness of the Western Naval Command. 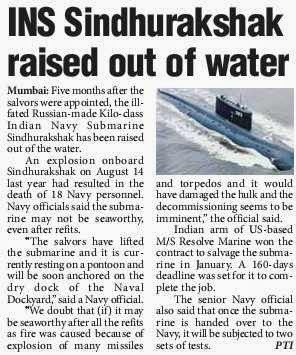 The submarine had sunk on August 14 last year after an explosion killing all 18 personnel on board. It is submerged in its berthing dock in the Naval dockyards in Mumbai and is being salvaged to verify the exact reasons for the mishap. The work on the salvage operations is in advanced stages as the submarine has been lifted from the ground by the American salvage firm and is expected to be brought out of water anytime, Navy officials said. 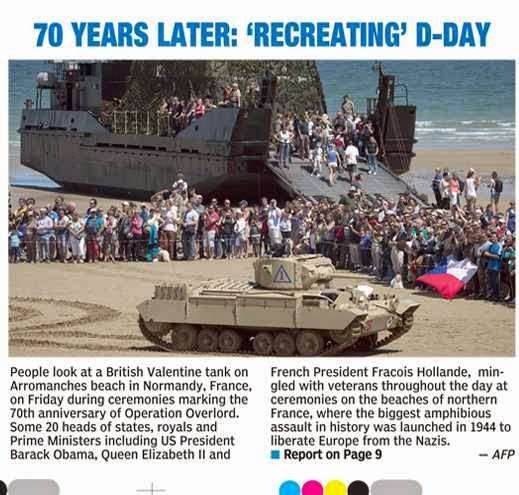 The Defence Minister may get to see the submarine out of water, they said. During his visit to the Western Command, Mr Jaitley will also commission two fast-attack craft ICGS Achook and ICGS Agrim, of the Indian Coast Guard. This is Mr Jaitley's maiden visit as Defence Minister as he has been busy with briefings by officials and the chiefs of armed forces on the functioning and performance of various departments. 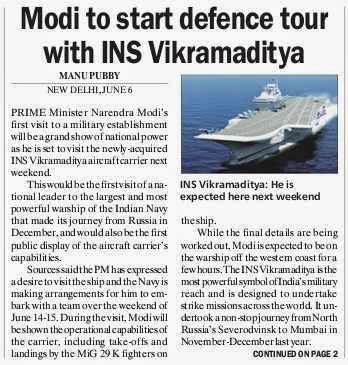 Mr Jaitley will also visit INS Viraat in Mumbai harbour and then move to review the functioning and operational preparedness of the Western Naval Command. INS Viraat was till recently the only aircraft carrier in the Indian Navy and the force is working towards keeping it operational for a few more years to meet its requirements. The Western Naval Command, considered to be the sword-arm of the Indian Navy, suffered major blows in terms of the loss of INS Sindhurakshak. The Defence Minister has been invited by the armed forces to visit far-flung bases to show solidarity with the troops and Prime Minister Narendra Modi is believed to have been invited to visit Siachen glacier by the Army and largest warship aircraft carrier INS Vikramaditya by the Navy. New Delhi, June 4: The defence ministry is drawing up a list of major acquisitions for the armed forces that should be contracted urgently. Defence minister Arun Jaitley was understood to have asked secretaries to prioritise acquisitions based on urgency of requirement and processing of the cases. Topping the list of pending acquisitions is the fighter aircraft for the Indian Air Force. The IAF selected the Rafale fighter jet over two years ago. The cost of the acquisition of 126 Rafales could now top an estimated $20 billion. The IAF has also projected a need for six additional C-17 Globemaster III strategic airlifters. For the army, the defence establishment has been aware of the need for heavy artillery guns. The artillery modernisation plan is estimated to cost about $3.8 billion. The army’s biggest force-accretion was set rolling last year with the CCS approving the creation of a Mountain Strike Corps. 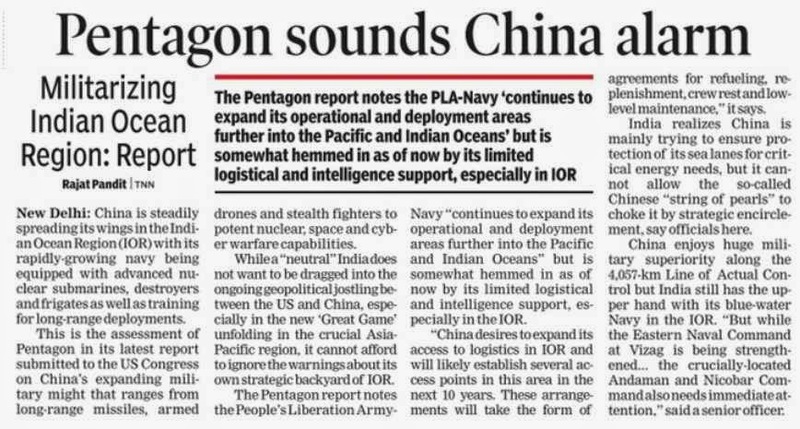 To be headquartered in Bengal’s Panagarh, the corps will be equipped for the China frontier. A crucial element in its arsenal will be the ultra-light howitzer, a Bae Systems made M777. The proposal to buy 145 of these guns has been in the works for over five years. The army and the air force have also asked for light utility helicopters that can operate in the Siachen Glacier area. The Army Aviation Corps has asked for 197 such helicopters. The IAF has also selected Boeing’s Chinook CH-47F helicopter for its heavy rotorcraft need and the Apache Longbow AH-64D for its attack helicopter requirement. There has been tardiness in procuring 16 multi-role helicopters for the navy costing nearly $6 billion. In a path-breaking move towards women empowerment, the Narendra Modi government is all set to accept Indian Army's proposal to offer permanent commission to women officers. Unlike countries such as the US, Israel, Australia, Sri Lanka and Sweden, where women officers serve in combat roles, India has not opened combat field to women officers. The adjutant general directorate in the Army Headquarters, New Delhi, has sent a detailed proposal to the ministry of defence led by Arun Jaitely to have women officers in units like Intelligence Corps, Signals Corps, Ordinance Corps, Army Service Corps and Electrical and Mechanical Engineers Corps. 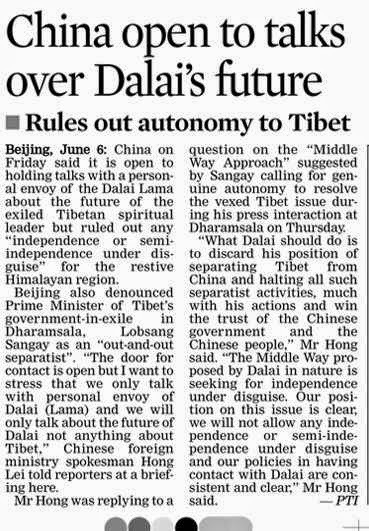 "The proposal is under the ministry's consideration. 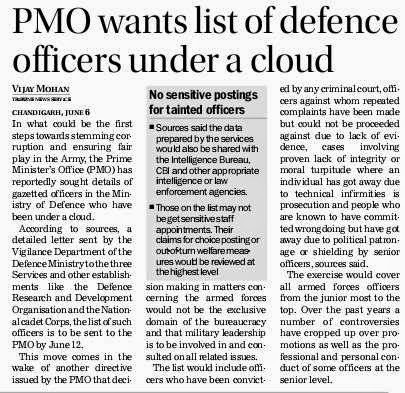 Beyond this, I cannot say anything," a top defence ministry official said. At present, women can join the army as short service commission officers and get posted in less-critical branches such as Judge Advocate General branch and Army Medical Corps and Military Nursing Service. Until now, the army's stand has been that women cannot be granted permanent commission as the bulk of the junior commission officers (JCOs) and jawans, who hail mainly from rural India, are not yet ready to accept a woman as their leader in combat situations. Even the Indian Navy and the Indian Air Force have also not opened doors to women officers in combat role. 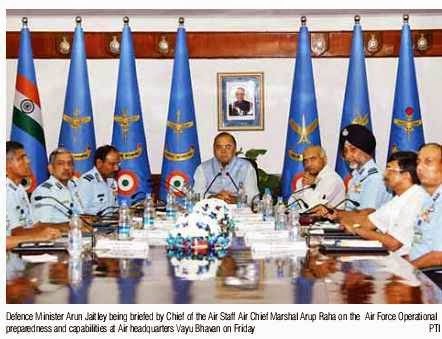 The mindset of the forces against offering key positions to women officers can be judged from the fact that recently IAF chief Arup Raha remarked "women are physically not suited to fly fighter planes". promote a woman officer up to the rank of a Colonel, which is mandatory to be the commanding officer of the unit. "By giving permanent commission to women officers, the army is giving them an opportunity to command a unit. Though, due to erratic or unpredictable battlefield, keeping women officers in combat role is a bit difficult, there are places and support units where women can be posted," said an officer. NEW DELHI- Holiday, the first film on Indian Army is set to release in Pakistan on June 6, reported Hindustan Times. Directed by A.R. Murugadoss, the film stars Akshay Kumar and Sonakshi Sinha and is based on an Indian Army officer. 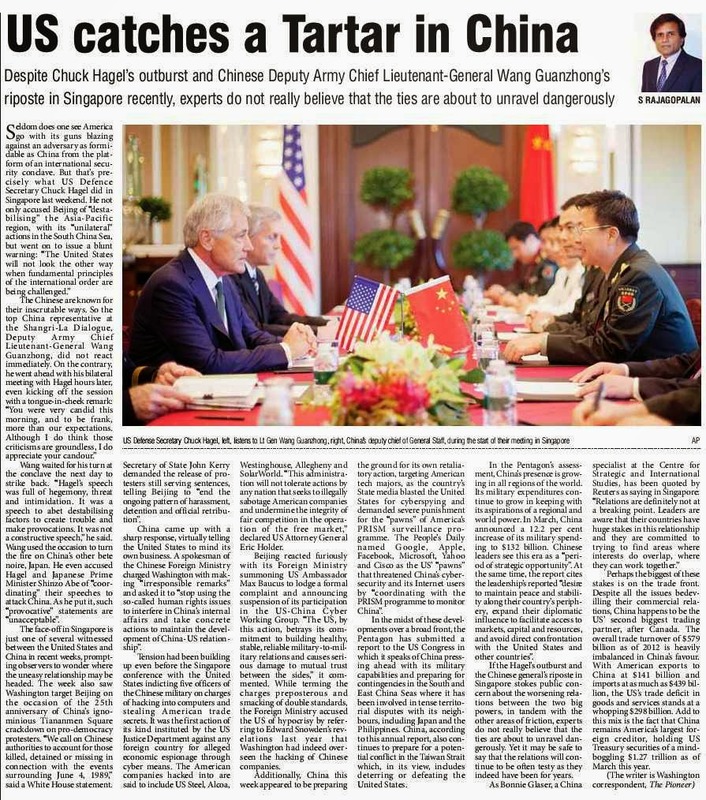 “It is a great start to a relationship between the two countries. Traditionally, talent from Pakistan would come down to India, but this would be the first time that an Indian film based on an army officer would be ­releasing in Pakistan. It is not only good for relations, but also for the business between the countries. I congratulate both the countries on this step,” said the film’s producer, Vipul Shah. “Akshay is a huge draw in Pakistan and there was a demand for Holiday, but fans across the border were not sure if it would see a release there. 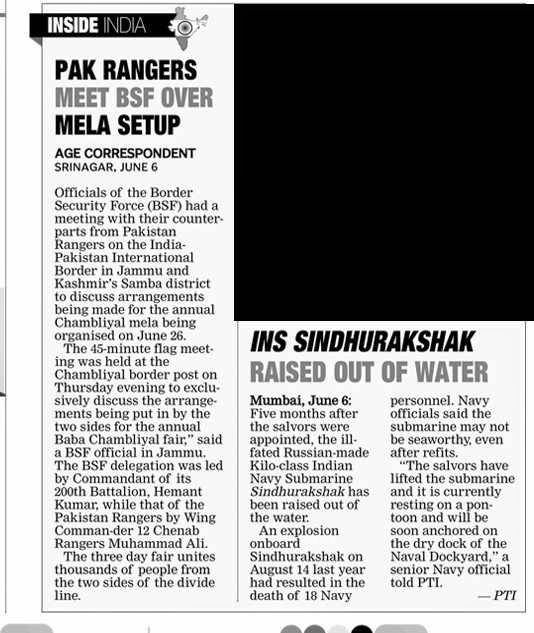 Now, they’re glad,” said a source from across the border. The source adds that some sensitive scenes had been edited to make it a suitable watch for cross-border audience. “The film has been censored by board members in the three major circuits in Pakistan — Lahore, Karachi and Islamabad,” said the source. A retired Indian Army Lieutenant General has been appointed member of a UN expert panel on peacekeeping that will advice the world body on how to use new technologies and innovations in that field. Lieutenant General (retd) Abhijit Guha is part of the five-member panel of experts appointed by Under-Secretaries- General for Peacekeeping Operations and for Field Support Herve Ladsous and Ameerah Haq. Guha has recently concluded a term as Director of the Office for Peacekeeping Strategic Partnerships in the Department of Peacekeeping Operations and also served as the former Deputy Military Adviser in the department from 2010 until 2012, a statement said here. The panel would visit field missions and consult widely with UN member states, partner organisations with similar field operations, non-governmental and governmental research institutions and think tanks as well as industry leaders in areas of interest to United Nations peacekeeping. The panel would convene in early June and in its final report, expected by November, would recommend how UN peacekeeping can benefit from ongoing technological innovations in a systematic and integrated manner in the longer term. The initiative is part of a concerted effort by the departments of Peacekeeping Operations and Field Support to realise efficiency gains and cost savings from the use of new and emerging technologies and innovations. The experts would advise on how these technologies can be leveraged to enable peacekeepers to respond more effectively to an increasing number of complex, multidimensional tasks in challenging field environments. It would also examine how technological innovations can improve operational effectiveness, multiply impact and enhance safety and security of both peacekeepers and host communities. The panel would be led by Jane Holl Lute of the United States, a seasoned expert on peace and security who is currently the Secretary-General's Special Adviser for Relocation of Camp Hurriya Residents Outside of Iraq. The other members are Major General Michael Fryer of South Africa, Major General Ib Johannes Bager of Denmark and Walter Dorn of Canada. The members have considerable experience and understanding of peacekeeping and in particular the need for new technologies and innovations to improve performance in carrying out the critical tasks entrusted to peacekeepers, the statement said.